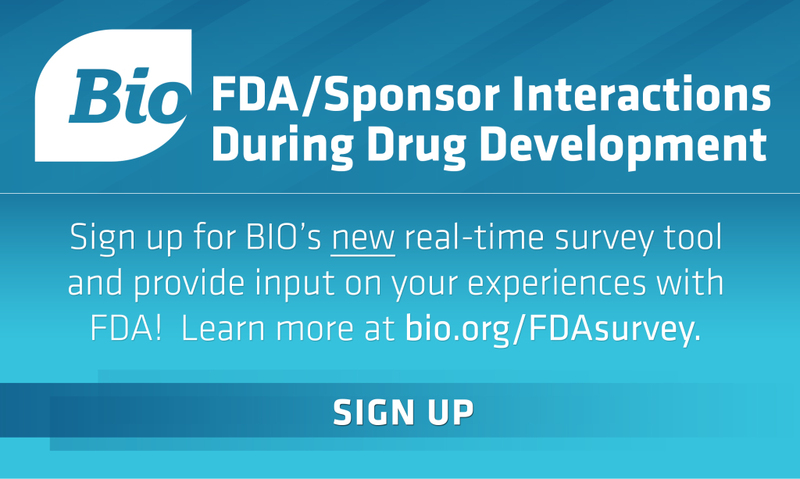 In August, the Biotechnology Industry Organization (BIO) announces a first-of-its-kind survey tool on FDA/Sponsor Interactions During Drug Development to better inform policy initiatives designed to improve FDA and drug sponsor coordination and communication during drug development. This will serve to inform the next reauthorization of the Prescription Drug User Fee Act (PDUFA VI), which will begin in late 2015 with final enactment expected in 2017. “Sponsor input is critically important for BIO and the entire industry to understand the real challenges associated with the regulatory process to help guide our discussions with FDA and ultimately work with Congress to establish new and effective measures to implement under PDUFA VI,” said John Maraganore, PhD, CEO of Alnylam Pharmaceuticals and Chair of BIO’s Emerging Companies Section Governing Board. Survey responses will help assess FDA-sponsor interactions during drug development and address problems, particularly those that result from inconsistencies between review divisions. The survey will focus on individual clinical programs for products that are in the pre-clinical testing phase through the clinical testing phase, prior to submission of an initial NDA/BLA, and responses will be held strictly confidential, blinded, and aggregated. Sponsor input will help identify areas where policies, regulations, and practices are working well and should not be changed; and identify areas where policies, regulations, and practices need improvement in order to make the process more efficient and effective. Participants will have access to the survey tool 24 hours a day, seven days a week so that responses can be updated on a continual basis. The survey is open to all biopharmaceutical representatives regardless of membership within BIO. Participants will be provided with an annual report on the survey results and invited to join exclusive BIO webinars to discuss survey results with industry leaders and regulatory experts. The survey can be accessed at https://fdasurvey.bio.org. Dr. Maraganore discussed the upcoming PDUFA VI reauthorization in a recent BIO Buzz Center video interview that can be accessed here. In 2013, “biosimilars” were a hot topic at the Arizona Legislature. In the end, the bill to define the classes of biosimilars in Arizona statute along with the the process for substitution did not move forward to the floor as key stateholders and legislators continued to research and discuss the issue.